This is the original sweatband made of non-woven material. It ties around the head and can be worn with or without helmet. 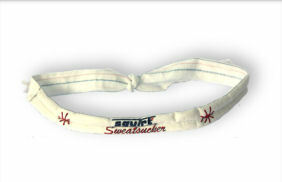 This is an improved version of the original sweatband made of wicking fabric and elastic tie-straps. It can be worn with or without helmet. 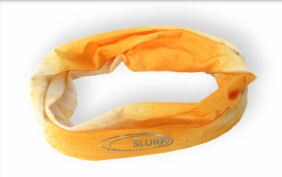 The trendy SLURP is the same functional device sown into tubular headgear. It can be worn with or without helmet and is suitable for any sport for continual sweat removal – even when saturated.